We are starting a kid friendly burn in Xanadu Florida, and we are hoping to get flow toys, silks, rings, drums, into the kid’s hands early. We are looking people who may have props or know anyone who does who wants to gift them to us for the kids. We are a Florida non-profit LLC and working on getting our 501c3, but don’t have it yet, so you would have to be ok with giving it without being able to take a write off. If you would like to come to our event and volunteer to teach the kids we would love it! We are also looking for, someone who might have a design for an interactive effigy to build with the kids contributing some part of it. A conclave lead, who would be willing to do a guided glow toy conclave with the kids before their effigy burn. 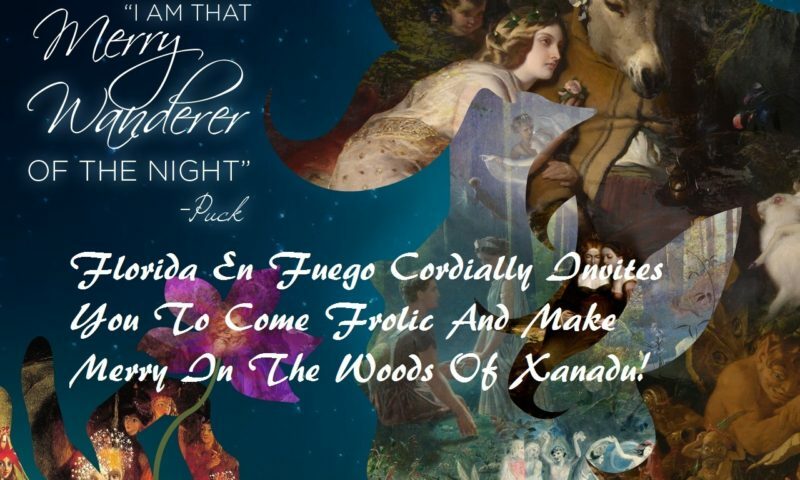 Our next event is Summer Night’s Dream, June 1st thru 4th. NO PETS will be allowed. Properly documented service animal service animals are always welcome. NO EXCEPTIONS. Service animals have always been welcome at Xanadu. If you will be bringing a service animal, your companion must wear its gifted glow collar at all times along with an event band on the collar. Service animals MUST BE ON A LEASH AT ALL TIMES, unless they have special needs to be off leash. If your animal becomes a nuisance, you both will be asked to leave. Xanadu IS private property and we reserve the right to refuse entrance or, to eject at anytime, anyone for any reason. Please consider that this is North Florida in the swamp. We have large birds of prey, snakes, ticks (lots of ticks) and alligators. Make sure to keep your service animal safe from these indigenous creatures. To all participants, we ask that you treat these service animals and their companions with the courtesy and respect they deserve. If you see that they are wearing a collar with a band then trust that they have been permitted to the property and they should be welcomed as members of our community. Please NEVER TOUCH a service animal without first getting permission from its companion. CONSENT ALWAYS IS REQUIRED in all things in our community! IT IS NOT A PRINCIPLE, IT’S THE LAW! Please be aware of this at all times. These animals are working whether or not you see it that way and your energy/excitement can affect them and how well they can do their service. The companion has no way of knowing if something you have in your system may be transmitted to their animals through direct contact. Please be respectful if you are not given permission, this could be for many reasons that have nothing to do with you and everything to do with the companion or animal. We are an all inclusive community, please extend that to our service animal Phambly.